Beta Innovations LLC provides strategic and tactical product development services for groups developing new tools for life science laboratories. We help our clients launch new technologies that are incorporated into practical instruments and meet scientists’ needs and user expectations. We provide management and technical guidance to support product design and development, assist in the regulatory approval process, develop strategies for manufacturing and product roll-out, and support the early stages of product testing and marketing strategies. 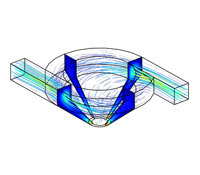 We recognize COMSOL Multiphysics as an important design tool for evaluating product concept candidates and minimizing the number of physical prototypes needed. Additionally, the software provides us with a deeper understanding of system dynamics in which physical measurements are difficult or impossible to define.